Beautifully-illustrated hardback book telling how God made people to enjoy being delightfully different, but all part of the same family. A delight. Cuddle up with a little one and share the news of God’s very good idea. Touching and beautiful, this will engage kids and their parents too! What a great resource to share with the next generation. "A unique and fabulous book"
It's beautifully illustrated, with lots going on in the pictures that you can talk about. Really lovely details. The story is The big picture: how God made humans in his image and loved them. And we were to love Him and love each other. The book talks about how despite us not being able to love God or each other the thanks to sin, God still loves us and sent Jesus. The last part of the book explains the role of the church in God's plan. Another overarching theme in the book is that diversity is God's idea and that we are all different and all the same, because we all reflect the image of God. It's really beautifully explained and illustrated. I would recommend this to parents and to Sunday school teachers. After reading this book for the first time, I wondered why it hadn't been written before. A necessary, challenging, joyful reminder that the church should be the most diverse group of people on earth; especially when SO often Christian books even show Jesus with a white face. I love reading this to my children and I think it's one every Christian family should have on their shelf. This is a must-have for any family! My kids ask to read it over and over, and I GLADLY oblige them. 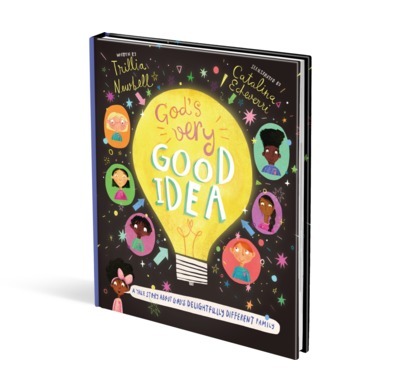 Just read God's Very Good Idea with my elementary aged sons and I'm so thankful God placed this book in our path. Such a clear and accurate summary of God's truth as revealed in Scripture. I will be buying extra copies for family, friends and bday gifts. Thank you for holding out gospel truths to our children in a way they can understand without watering down the message. Excellent work!!!! God is all about variety. He didn't create just one type of animal, one type of tree or even one flower, but a beautiful multiplicity of diversity for us to enjoy. Why would we be hesitant to accept his diversity in humankind? Trilla's book represents the beauty of the church's multicultural design. The Apostle Peter said, "God hath shewed me that I should not call any man common or unclean." (Acts 10:28) This book is a wonderful way to approach teaching our children God's point of view on diversity. That common ground of the need for a Saviour brings us all together. And, the illustrations are delightful! Children will want to hear the story over and over again. We bought this to read to our grandson, but it stayed as a coffee table book for weeks - adults, both Christian & non-Christian, read it as much as kids. It is a clear presentation of God's purpose, his plan & his love. I love this series of books for the sound & accessible way they present God's Word to children. This book is a clear and beautiful introduction to the truth that God created a diverse world, and that that's a good thing. It will help children to understand that although people are different, we're all made in God's image and, as sinners, we're all in need of the same gospel. I think particularly if you're not living in a multicultural or diverse setting, this book will communicate hugely important truths that we simply must teach our children. We live in central London, and although diversity is the norm for my children, I'm glad that we have this book to articulate these things in such an appealing way. I hope that more books like this will soon be written which explore the topic in greater depth for slightly older children.